Today we bring you an entry suitable for small spaces, and there are many people who are inclined to purchase small studio apartments in the center of large cities. Apartments that general rule does not have much space. Today we bring you an ideal solution. I already had talked on occasion that many people chose to do a double height, using the rooms with high ceilings. The element of today would have a bit this intention. 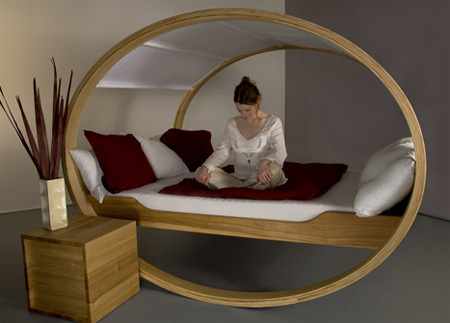 These beds “bed up”, ideal for bedrooms where we have little room for our bed. We can say that these beds “bed up” are continuing on a day which accounted folding beds in cabinets, which, I must say, we also love its retro and vintage. These wonderful beds have a system that will lift up the top of our stay, very close to the ceiling. Thus, the eye will not see, with the bottom of it completely free to fill it with other objects, such as a desk, sofa or whatever we want. This type of bed has several different heights, so we can stick it to the roof more or less, depending on how high this. In addition, it also has legs to support it on the floor, if we want, even a graceful staircase that can be used to climb to the heights and sleep in the sky of our room. Solutions how are you are a real breakthrough, because we have to keep in mind that a bed is perhaps the largest object of an entire room (not counting non wardrobe wardrobes). So, with this mechanism, we will add an extra space to our small room, now building the entire space of the same, even the highest, the roof.